You read right...the Gnome eats, in Stillwater in fact. His whole crew did too and they loved every bite! Who is the Gnome you ask? He is the one and only Travelocity Gnome, better known as the Roaming Gnome. Visiting as a sponsor for ESPN College Game Day, the Visit Stillwater team had the unusual, and yet entertaining assignment of welcoming the Roaming Gnome and his team to Stillwater while planning their stay around experiencing the true essence of our unique community before the big game. From Motocross to dairy calves, the Roaming Gnome went home with a handful of unforgettable memories and a full belly. Stillwater residents and visitors treasure our iconic local cuisine and we wasted no time introducing the Roaming Gnome and his crew to the flavors of Stillwater. 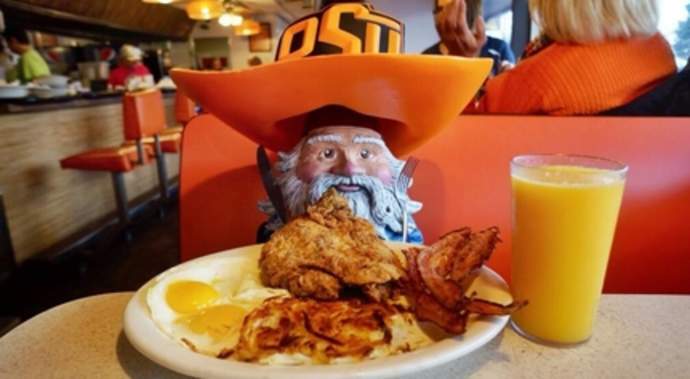 Here&apos;s some memorable food moments captured by the Roaming Gnome on Travelocity&apos;s Twitter feed and if you&apos;re visiting Stillwater, go ahead and follow the Roaming Gnome&apos;s footsteps for your iconic food experience! Eskimo Joe&apos;s Cheese Fries is as iconic as it gets with over 400 retweets from the #Roaming Gnome&apos;s tweet. 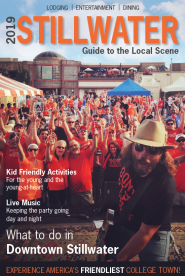 It&apos;s safe to say Eskimo Joe&apos;s is considered a food group/food staple to Stillwater visitors and locals. Head over to www.eskimojoes.com for a full menu of fabulousness! Nothing says good morning or good night for that matter in Stillwater like Shortcakes. A college student&apos;s mainstay in Stillwater and one of the best home cooked meals in town. Keep up with Shortcakes on their Facebook page. Since the 1950&apos;s Hideaway has been serving up pizza perfection and it&apos;s a dining must during your stay in Stillwater. Connect with the best pizza place on the planet here.